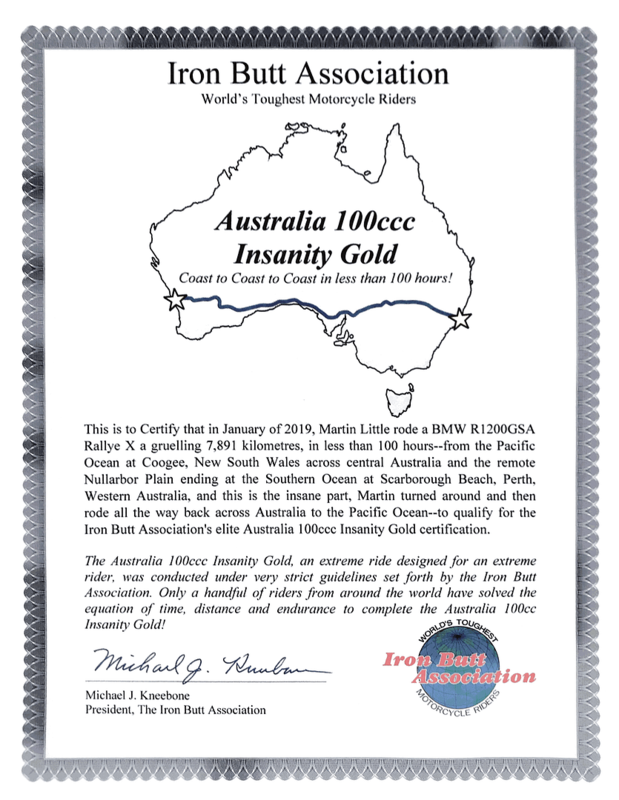 This ride was part of prep for IBR 19 and what could be better than a mid-summer ride across the Nullarbor Plain to Perth & back? With the weather forecast for extreme heat wave conditions for Day 1 of the ride I took extra precautions with additional hydration on the bike along with frozen ice packs that I could use along the way. I rolled into Coogee just after 2:00am to find a welcoming/farewell group made up of Ox, Tiger Bill, Vlad and Frans. Thanks guys for turning out to send me off! We collected some photos at the beach and then it was off to the Caltex in Coogee Bay Road to collect my starting receipt. Some friendly faces at Coogee to see me off! With a final goodbye I was off out the gate at 2:15am, slightly ahead of the planned start time of 2:30. Frans was riding with me as far as the Picton Road turn off and I was grateful for the company as we did our best to make sense of the road closures and night works that afflict Sydney at night. The M5 tunnel was closed with the detour taking us over Stoney Creek Road through Bexley and Kingsgrove. This is basically a suburban road and to see it packed with wall to wall B‑double trucks at 2:30am was quite a sight. I lost about 15 minutes with this detour but once back onto the M5 I settled into the ride to start making my way southwest towards Gundagai, my first fuel stop. Frans waved me on at Picton Road and I was on my own in the night, it was warm and the stars were out, so perfect riding conditions. 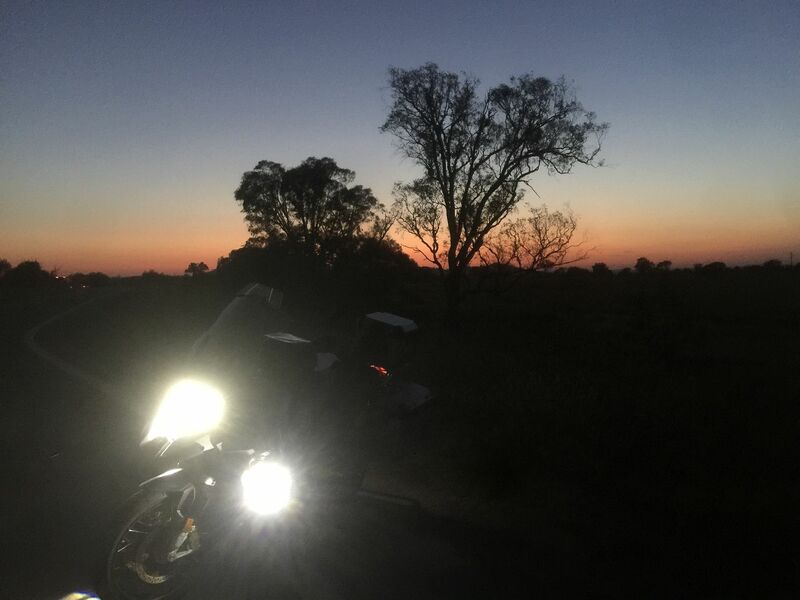 The first leg down to Gundagai was uneventful, as I watched the sun come up passing Yass and Jugiong, stopping briefly for a photo before rolling into South Gundagai for the first fuel stop of the day. 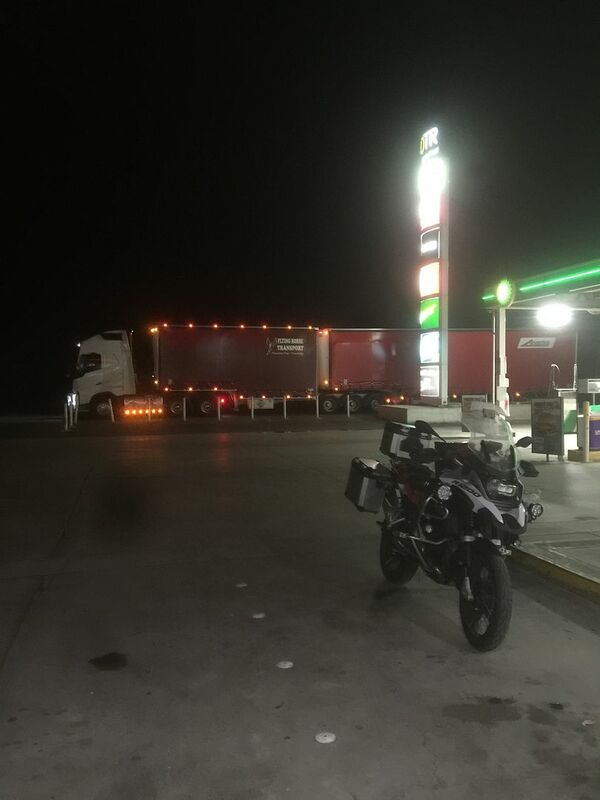 I took the opportunity to have a light snack while I fuelled up the bike and I was back out on the Hume Highway pretty quickly as I continued on my way to Wagga Wagga. 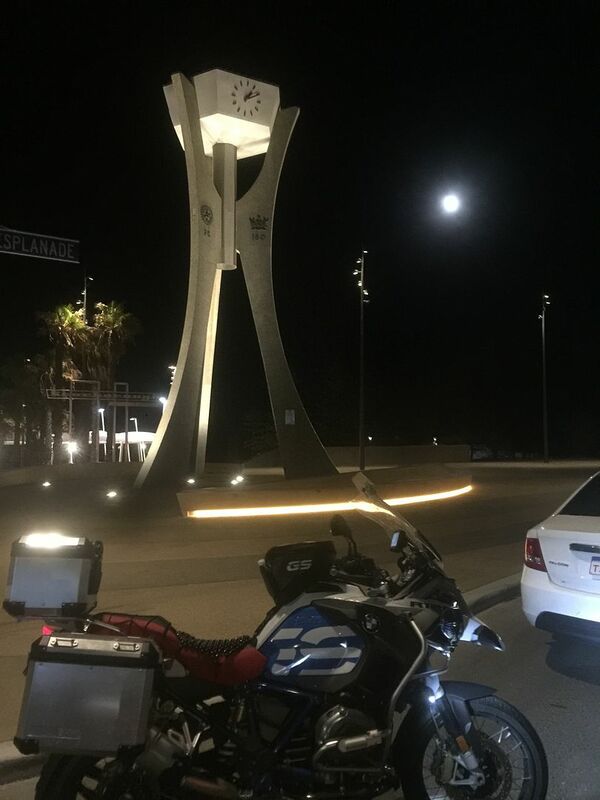 My timing for the ride through Wagga was perfect, just before the morning rush hour and I was through Wagga in no time and heading for Narrandera. By now the temperatures were rising and I made sure I kept sipping water and my electrolyte drink. Traffic was light and it was just a nice summers day to be out riding. At Narrandera I made the decision to stop and put on my cooling vest and change over neck tubes to a wet cold one. The temperature was OK (30 degrees) but I was conscious of heading across the Hay Plain mid-morning and staying on top of my cooling strategy. 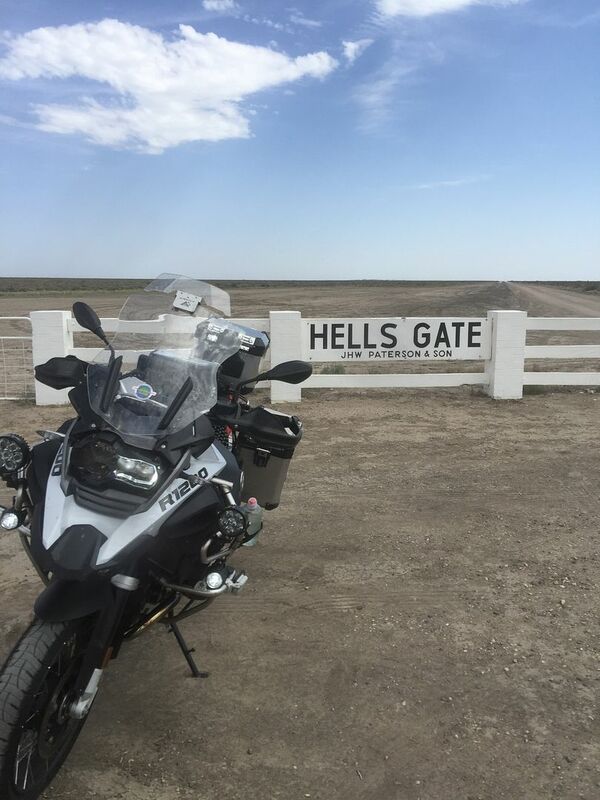 This turned out to be a wise decision with the temperatures jumping up to 35-36 degrees on the plains and gradually increasing as I rode westward. At the fuel stop at Hay, I refreshed the cooling vest, topped up my water supplies and got back on the bike quickly. I had settled into a steady rhythm, which I didn’t want to break despite the heat. From Hay, it was onto Balranald, then Euston. Ron was waiting for me along the way and provided some welcome company, including guiding me through Mildura to shave a few minutes off my travel time. 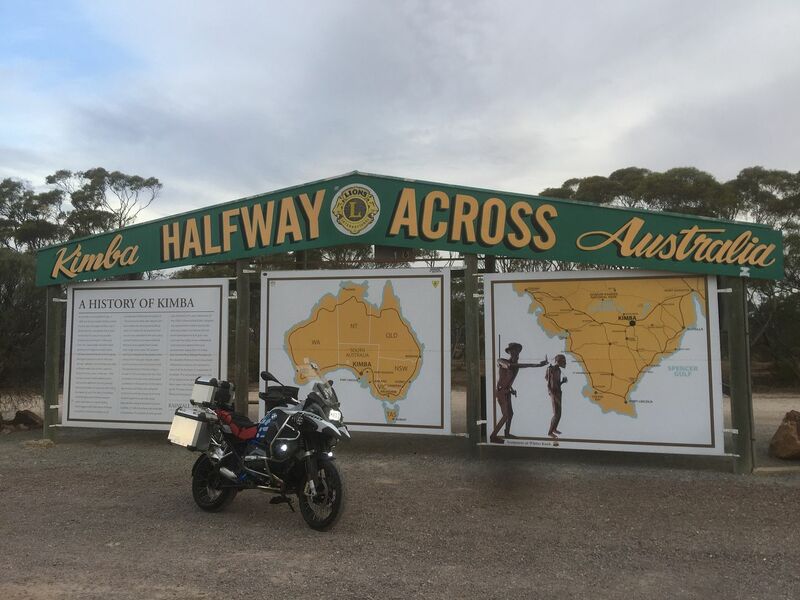 We crossed into South Australia at Yamba, where I had to undergo quarantine inspection of the panniers, topbox and tank bag. They seem to have really toughened up the inspections recently including issuing fines! 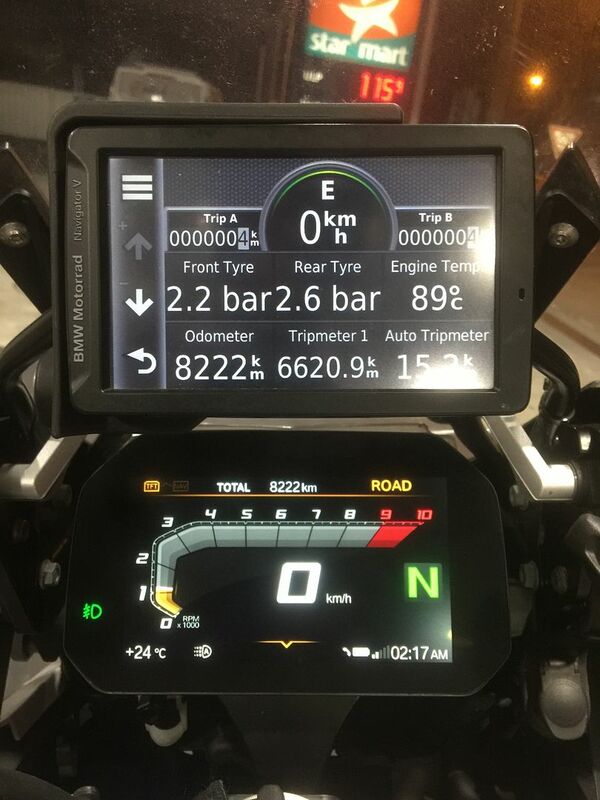 By now the temperatures were very hot and rolling into Renmark for fuel stop number 3 I was showing low 40’s on the temperature gauge. I decided to take a few extra minutes for a cold drink and a sandwich. My reason for this was twofold: I was ahead of schedule and could afford the time off the bike, but more importantly I wanted to replenish my energy levels ahead of the heat and wind that was to come later in the day. Leaving Renmark, Ron came with me as far as the Goyder Highway turnoff, where he waved me on, I was really grateful for this as I knew Ron faced a ride back to Mildura in 40+ degree afternoon heat. 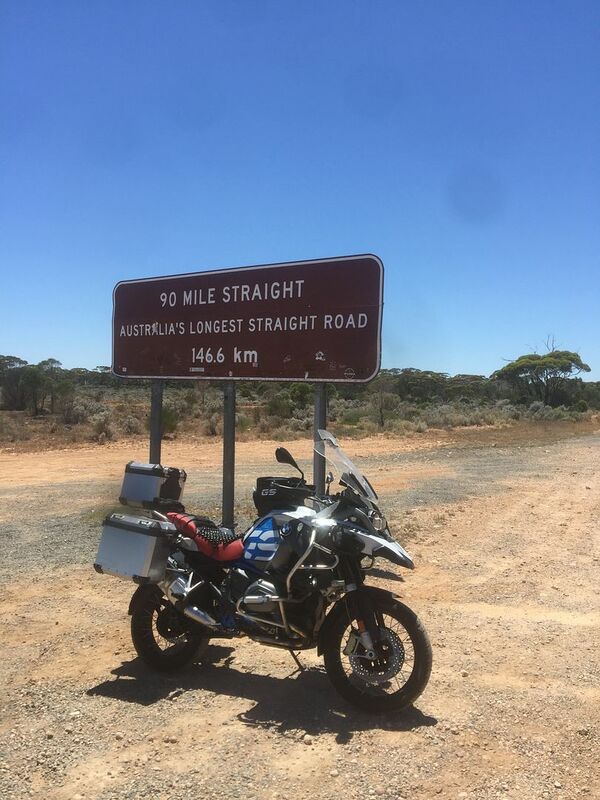 I love riding this section between Renmark and Port Augusta, past World’s End Highway, Burra, Crystal Brook and Spaulding. Today was different, the temperatures were nudging mid to high 40’s and the wind had got up and was blowing the bike around, which made controlling the bike difficult. I was pleasantly surprised to see Reg and Daisy appear on their bikes to welcome me/guide me through this section. We stopped briefly to chat, but the conditions were not conducive to standing outside. Pressing on, Reg and Daisy waved me on about 45 minutes later: by now the conditions were terrible, the wind was ferocious and was like a blast furnace. I saw 48 degrees on the temperature gauge at one point and was drinking down water and electrolyte continuously. Finally turning onto the A1 I was happy to just cruise the last hour into Port Augusta where the temperature was a balmy 38 degrees. But windy! Time to cool off and re-hydrate! 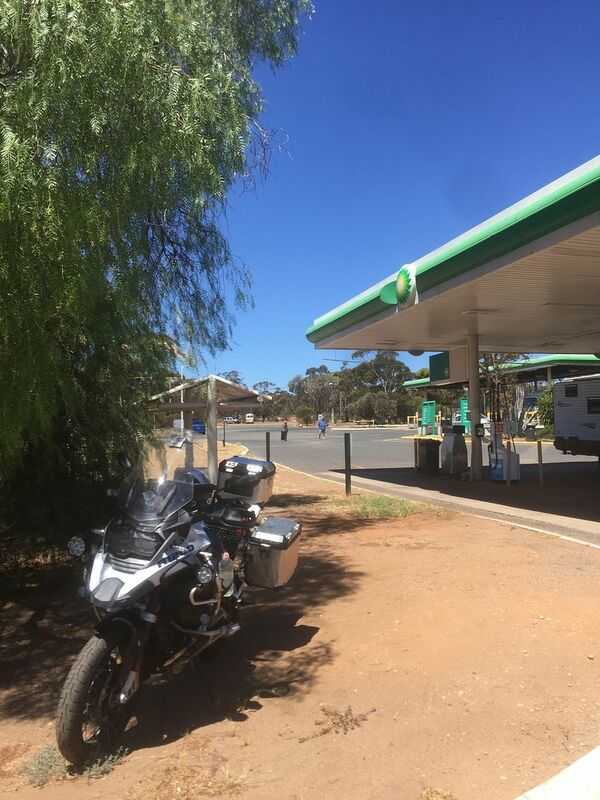 Port Augusta was a scheduled fuel stop, and I took the opportunity to stay inside the truck stop to make the most of the air conditioning and rehydrate. The last 3 hours riding had been some of the worst riding conditions I had seen in a long time. Feeling refreshed, I set out for the final leg of the day to Ceduna. 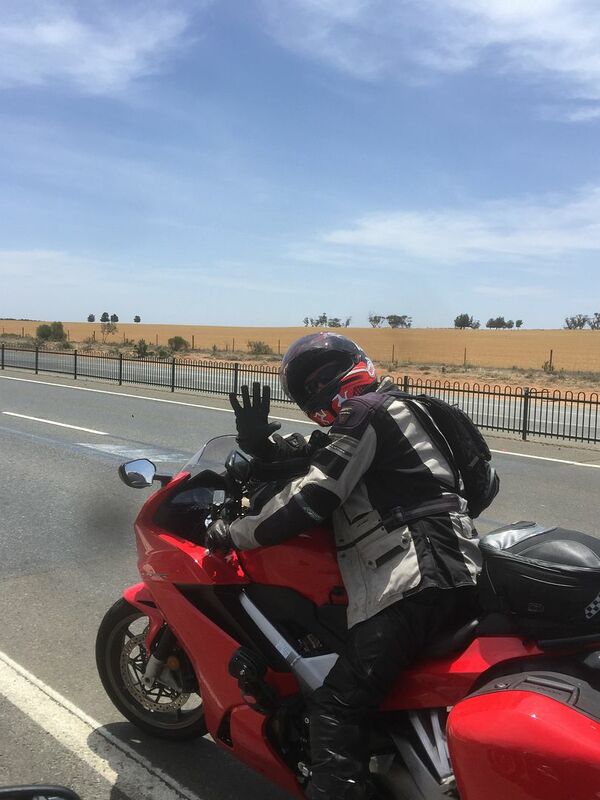 By now the wind had worsened and as I headed west out Port Augusta the bike was being blown sideways across the lanes, and the temperature was still high 30s. Iron Knob looked spectacular in the setting sun, although the dust being blown off made riding conditions even more hazardous. And then the wind just died away and it became a gorgeous summer evening, with the setting sun ahead of me. 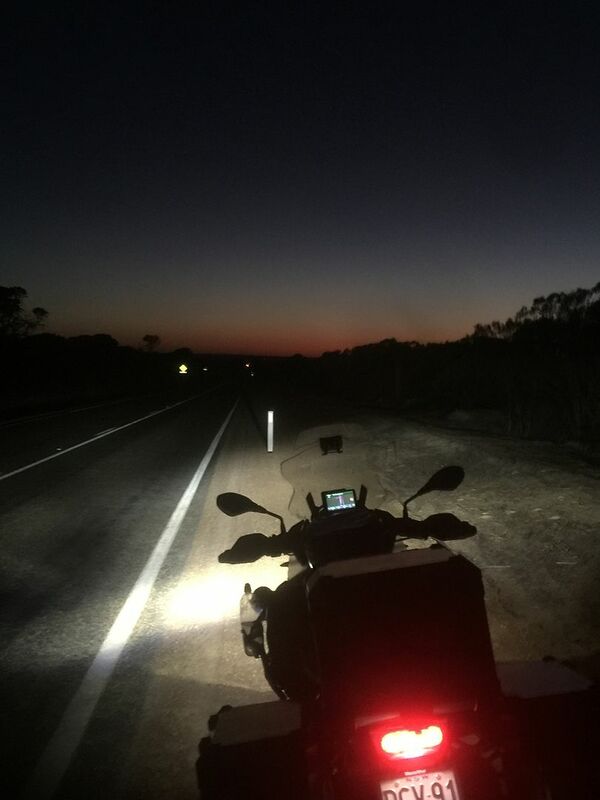 At Kimba I topped up the tank and then continued on my way into the dusk, watching the sun disappear and the stars come out. Sunset heading towards Ceduna, SA. At Poochera I took 5 minutes off the bike to shut everything off and just enjoy the silence under the stars. Heaven! 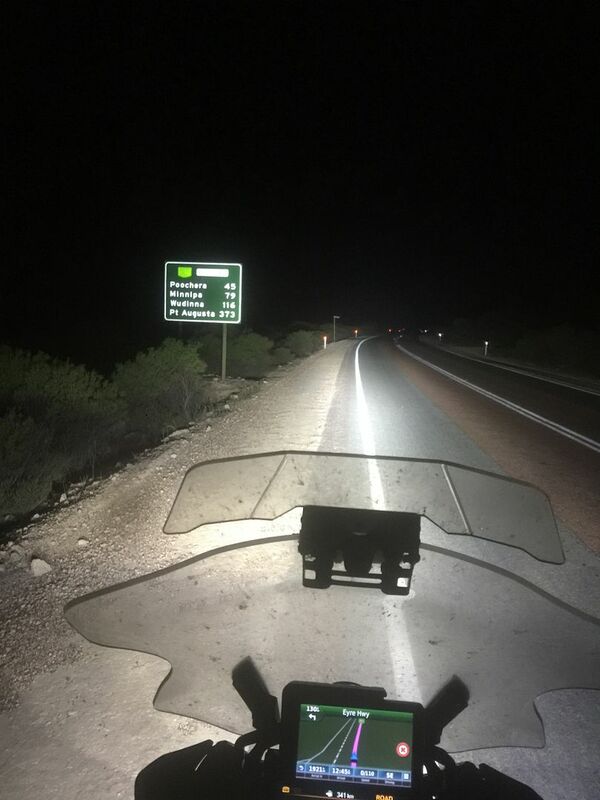 Back in the saddle it was an uneventful ride into Ceduna, I had the road to myself and I rolled into BP One on the Eyre Highway in Ceduna just after 11:00pm. I refuelled the bike, collected my room key, got the attendant to sign my witness forms and hit the sack feeling very satisfied with Day 1. The miles just rolled by in the dark, absolutely nothing about, or stirring. There were a few lights on at the Yalata Road House but otherwise just darkness. 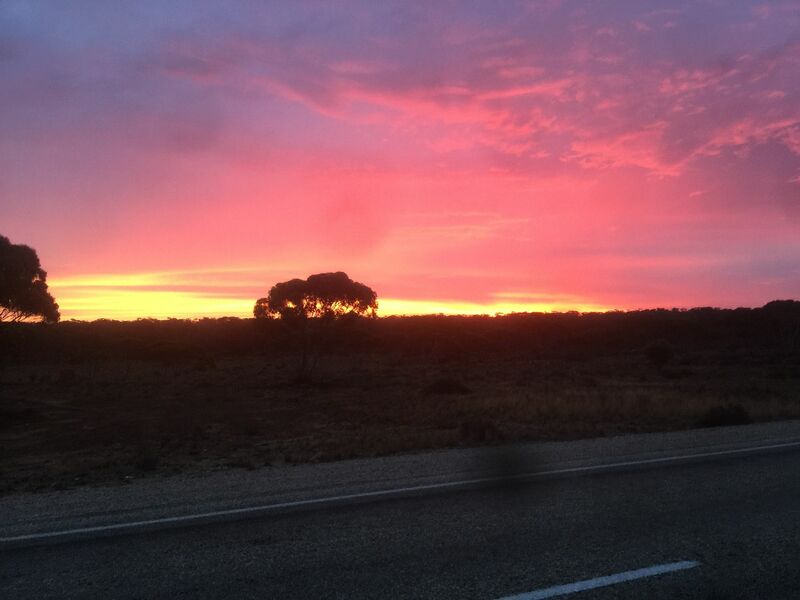 Dawn slowly crept into my rear vision mirrors as I approached Nullarbor Roadhouse. 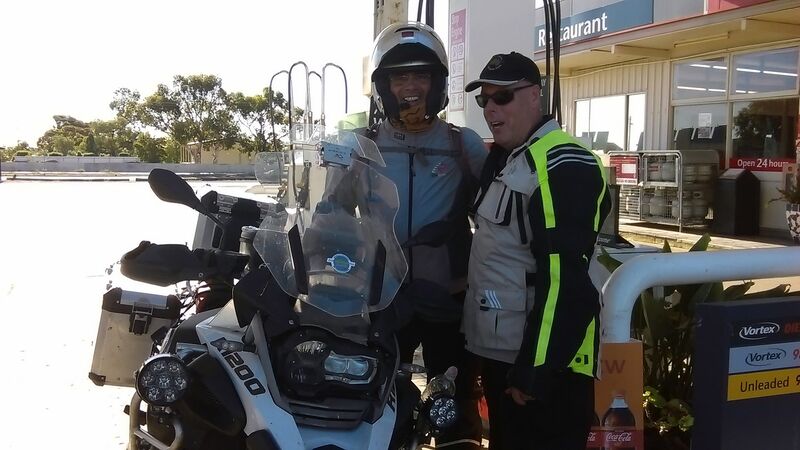 I stopped briefly for a photo at the Roadhouse before continuing towards Border Village, where I planned to refuel and have a slightly longer stop. By now a stiff headwind had got up which played havoc with my fuel consumption. I rolled into Border Village on reserve, with about 30km range left in the tank. Close, but enough! Fuelled up I made the crossing into WA, with the obligatory quarantine inspection at the border. It was a slow news day as I got the full inspection but was eventually waved through. From here it was onwards and westwards, past Eucla, Mundrabilla, Cocklebiddy and toward Caiguna for my next fuel stop. The sun had come out now and while hot, low 30s it was not unpleasant, and I made good progress to Caiguna. Goodbye SA & hello WA...see you tomorrow! Once fuelled up from there it was onwards through the Dundas Nature Reserve towards Norseman. The hours seemed to drag now, with the road rising and falling in the midday heat, and the only relief being the holiday traffic. Norseman was relatively quiet, I refuelled quickly and headed north to Coolgardie. This section of road was much more interesting, and the miles slipped by effortlessly. There was a fair amount of traffic from the mines about, not surprising given it was a working day. Coolgardie was shimmering in a heat haze as I rode through. There wasn’t too much activity in the main street; not surprising given the heat. Next stop Southern Cross Road House! The roads were good, there were almost no roadworks, no traffic and I made great time to Southern Cross. At the Southern Cross Roadhouse, while waiting to pay for fuel I noticed on the tv a news article about a large traffic jam on the outskirts of Perth. I didn’t pay too much attention to it but I was to run into it later that evening. From here it was the late afternoon ride into the setting sun. There was a fair amount of sunstrike, although traffic was light. I recalled riding this section on my first 50CC on a Sunday afternoon in 2016 and the traffic was much, much heavier than today. A good thing. I breathed a sigh of relief as the sun moved down to the horizon and away from my line of sight, it was bad! The temperature also started to ease as I got closer to Perth. Heading downhill past the Northam turnoff I spotted two motorcyclists sprinting out from their parked bikes to wave me down, but I was past before I knew it. The reason for the waving was just ahead was the traffic jam that I had seen on the earlier tv news at Southern Cross. Sure enough, the traffic came to a halt and it wasn’t moving. The waving bikers were Gus and Steve who soon joined me and after a brief discussion we turned around and took the old road through Northam as a diversion. I found out later the road had been closed for some time due to a very bad accident. I now had the luxury of following Gus into Perth, while Steve brought up the rear. Gus was on a new FJR, which I hadn’t recognised as I was expecting to see him on his green machine. We wound our way through the hills approaching Perth, the city lights twinkling away in the distance. Once we reached the city proper there was a fair amount of roadworks and I had a near miss/oops as I almost missed Gus’s right turn at a roundabout while I assumed, we were going straight ahead. Recovered nicely! As we approached Scarborough, it got fairly windy & warm again, before we rolled into the BP Scarborough just after 9:00pm WST. 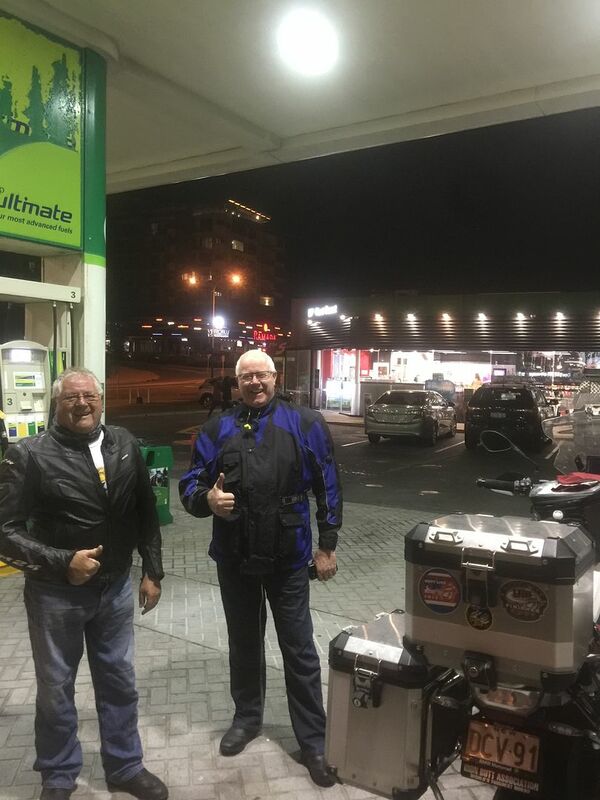 I got off the bike and finally got to shake hands with Gus and Steve, before fuelling up (making sure it wasn’t diesel – sorry Rob!). It was great to then chat for a while and make plans for the departure in a few hours’ time, before the guys shooed me off to get some sleep. I felt in reasonable shape after the 50CC but was looking forward to a few hours’ sleep. Checked in, bike parked securely in the hotel basement I hit the sack anticipating a good 3 & ½ hours sleep. I had no problem falling asleep. But then I was awake again, a quick check of the clock told me I still had 30 minutes sleep time, dang it! Still, I was awake and for sure I wasn’t going back to sleep. Nothing for it but to get moving. I messaged Gus to say I was on the way to the servo, finalised packing my things and went down to reception to check out and collect my all-important docket. Surprisingly the Hotel was able to issue me an electronic eftpos receipt this time, which was a welcome change. That done I motored across to the service station, through the early morning party-goers to find Gus and Steve waiting patiently for me. These guys are champions! After a quick chat and confirmation of plans Gus led the way out of the servo and we turned to head east out of Perth. Steve stayed with us for a while before waving goodbye and then it was just Gus and myself, winding our way back up the hills outside of Perth. The cooler temperatures as we climbed were a welcome relief. We spotted a few roos grazing beside the road near Northam, before Gus peeled off onto the Northam off ramp to head home for some sleep. I was super grateful for the company and guidance from both of the WA lads! From here I motored on through the inky darkness, with only the occasional vehicle to break the solitude. The small WA towns rolled by, including Doodlakine and Merredin, I entertained myself practising the pronunciation of these as I rode by. Ever so gradually the eastern sky started to lighten, the harbinger of dawn approaching, with the last of the stars blazing brightly above. 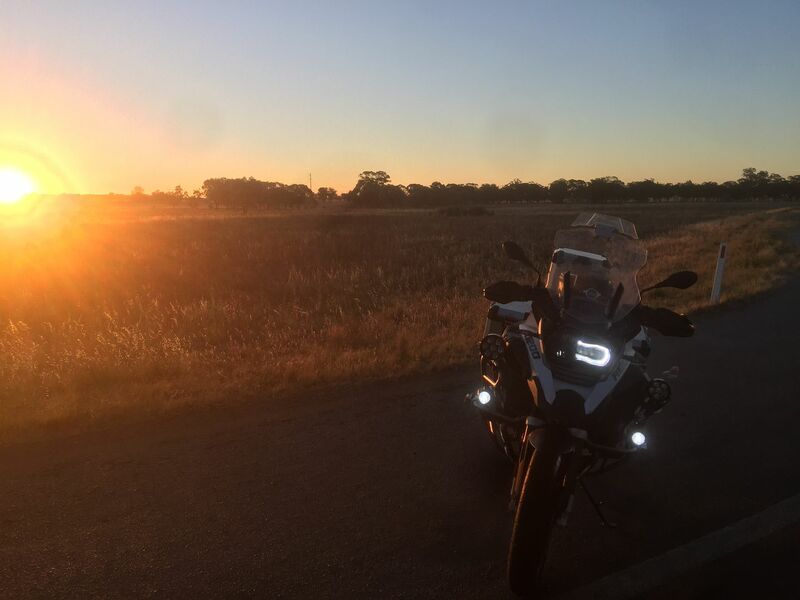 Sunrise was at Southern Cross road house, once fuelled up I shouted myself a coffee and bacon and egg roll, while checking my schedule and plans for the day ahead. 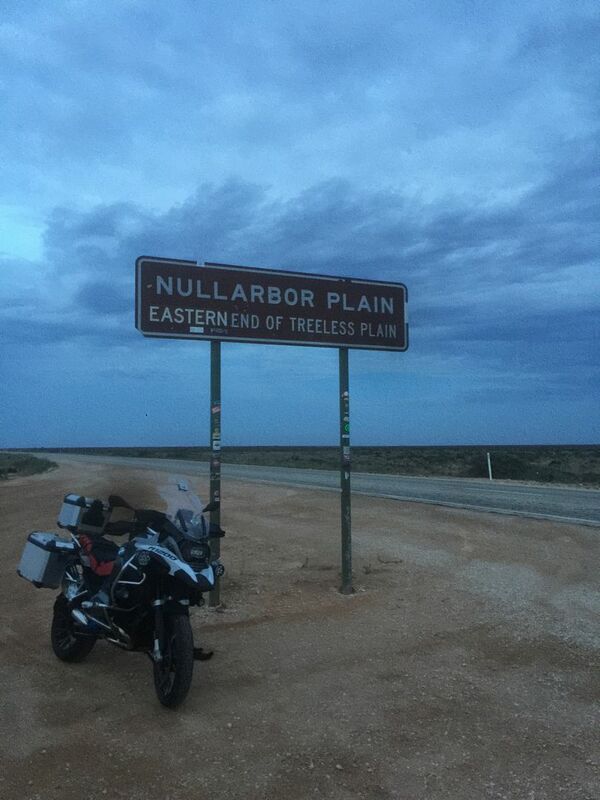 Satisfied that all was in hand I got back into the saddle and continued my journey eastward to Coolgardie. It was a glorious sunny Saturday morning, not too hot and not too much traffic about. 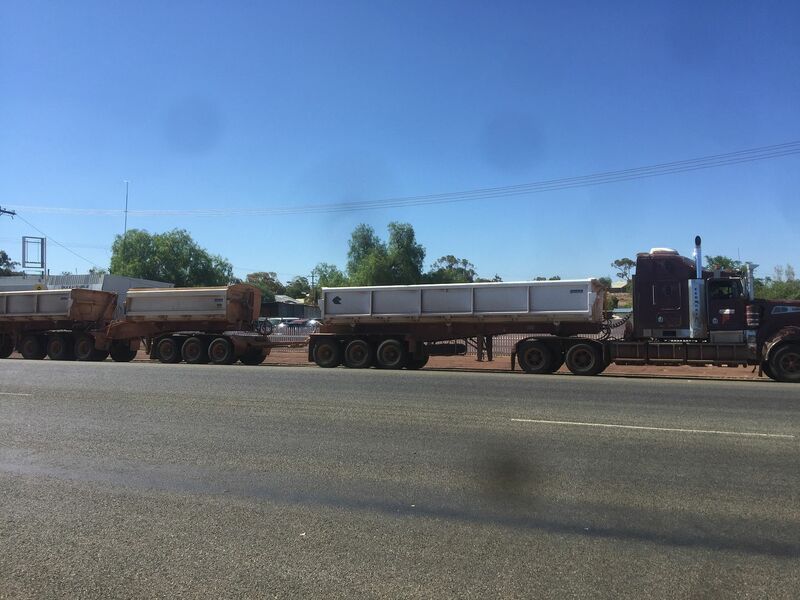 I made good time to Coolgardie, and just like yesterday there wasn’t too much happening in the main street as I rode through and took the turnoff for Norseman. This section of road was going to be my last set of corners for a while and it was a treat to just ride along enjoying the ride as the morning warmed up. I stopped briefly at the salt pans near Norseman for photos before calling into the Norseman BP truck stop for my next fuel stop. It was quiet still and I was in and out very quickly. While I had phone coverage I called Bec to say hi and for a chat, it was great to hear her voice and think of things back home. Climbing the hills eastward from Norseman through the western woodlands, it was now low 30s and it was a case of just settling in and watching the miles roll by in the morning heat. I let the music play for a while, content to just roll along, waving to the passing traffic while supping away on water and electrolyte drink. By the time I passed Balladonia, it was mid to high 30s with a steady head wind blowing, which was smashing my fuel economy. 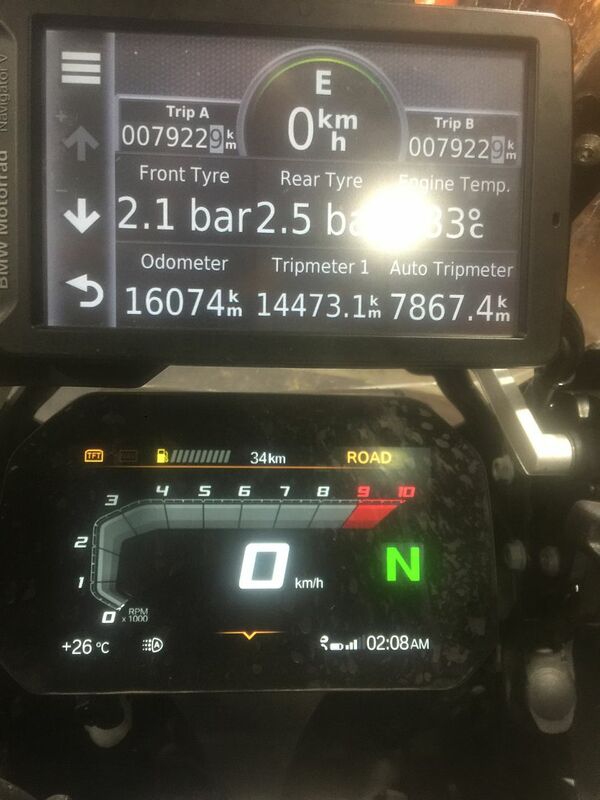 I can generally get 500+km out of a tank on the GSA, but not on this trip. I was averaging 400ish kms between fuel stops, due to the headwinds. Stopping at Caiguna to refuel it was hot, with very little relief from the bright sun. People were moving sluggishly about the Truckstop, with a mix of holiday makers and trucks. I made sure I kept up my hydration and then continued towards Border Village, my next fuel stop. From Cocklebiddy to Madura there was a lot of roadkill about, most of it fresh. The birds were having a field day. Approaching Madura, it started to cloud over and the view across the plains from the top of the pass was magnificent, the greys of the bush scrub contrasting sharply in the light with the black trees. It then started to get almost cool near Mundrabilla, the head wind strengthening and the skies becoming overcast. I passed a cyclist, giving him a wave, and then not too much longer passed a lone walker pulling a trolley as he plodded his way eastward. By my calcs he was a good 4-5 hrs at walking pace to Eucla. One way of getting some good exercise! I rolled into Border Village on reserve, with about 20km left in the tank. The head wind was tough going! Near Mundrabilla, SA. Strong headwinds! It was a quick turnaround at fuelling up here, I got waved through to the head of the queue by an understanding attendant who recognised me from yesterday, paid and then got going again after a chatting briefly with a fellow traveller who was interested in the bike. The Truckstop had a good feel and friendly efficient service, which I really appreciated. It was helping me maintain my rhythm and flow. Leaving Border Village, I soaked up the views of the ocean, it was a very stormy afternoon and the ocean looked wild and ferocious. I was getting buffeted around and passing trucks was becoming interesting to say the least. Not long later I overtook a lone cyclist battling the headwind heading my way. He was almost stationary into the wind. A good keen man! I hoped he had the sense to get off the road before the approaching dusk and make camp, as cycling at night in this wind with the semis would not have been wise. 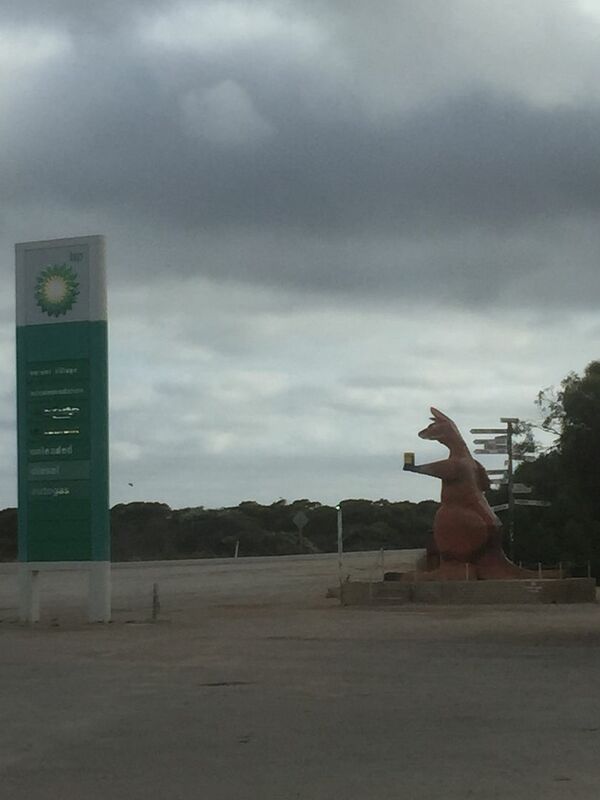 Approaching Nullarbor Roadhouse, I made a late decision to refuel there. I had planned to refuel at Penong but my fuel economy had worsened as the wind strengthened and while I had 5 litres of fuel on board for emergencies I didn’t fancy trying to do this in the dark on side of the road in this wind. I was in and out quickly, with the Roadhouse staff being super helpful. I rode out right on dusk for the next section through Yalata, Penong and into Ceduna, my next rest stop. In the gathering dark it started to drizzle, and the wind increased, which didn’t seem possible. In these rolling hills with the oncoming semis it was almost impossible to use the aux lights and every time a semi passed the other way it was a finally judged moment of anticipating the wind and truck blast. Coming up behind a semi, I had two roos cross the gap between us in the dark. No harm done but a good reminder to make haste slowly. I had plenty of time and after nearly 18 hrs of good progress I felt it wise to take things a little slower for the final run into Ceduna. There were also a lot of road trains about, which I felt was unusual for this time of the night. 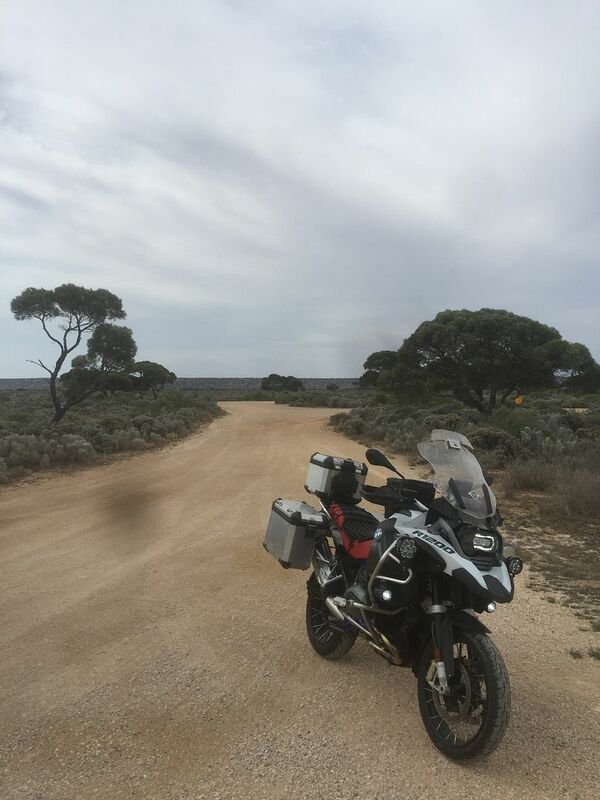 I stopped briefly at Penong to clean my visor and have a breather and then continued on my way for the final run into Ceduna. If anything, the road trains seemed to increase in numbers; plus the B Doubles coming the other way were almost nonstop. I was grateful to see the town lights and finally roll into the Truckstop for my rest stop. I refuelled and shouted myself a pie, for a day well ridden. Actually, it was the last pie available and it tasted delicious! Collecting my key and getting into my room, I was asleep very quickly. Ceduna, SA. End of Day 3. Celebrated with a meat pie, which was dercious! The alarm woke me this time, and I felt groggy and & out of sorts. I had had just over 4 hrs sleep, which was probably too much. I dragged myself out of bed and got organised. It had been raining overnight but all was clear now as I handed my key back in and purchased some more water. Riding out of Ceduna for Port Augusta the highway was much quieter now. The wind had eased slightly, and although it was still a strong headwind it was nowhere near as bad as on my arrival into Ceduna. I was looking to re-establish my riding rhythm and was content to cruise along letting the miles disappear in the darkness. This section of the ride is a long haul into Port Augusta, with still a full days riding after that. The small towns with their grain silos passed by in the dark. 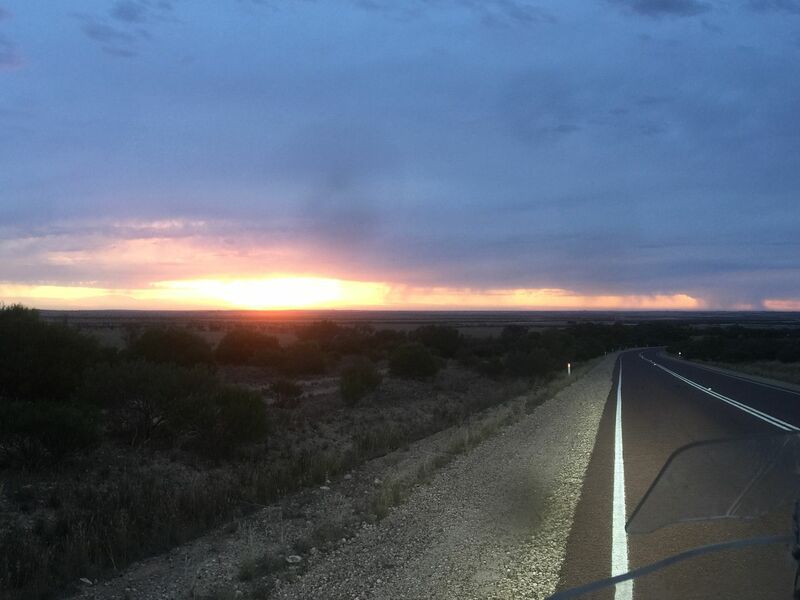 Nearing Kimba, dawn started to ease across the eastern skyline, and it was just on daylight as I pulled into the shell Truckstop in Kimba to top up the tank. I decided to grab a coffee, along with a bacon and egg roll, which I wolfed down. 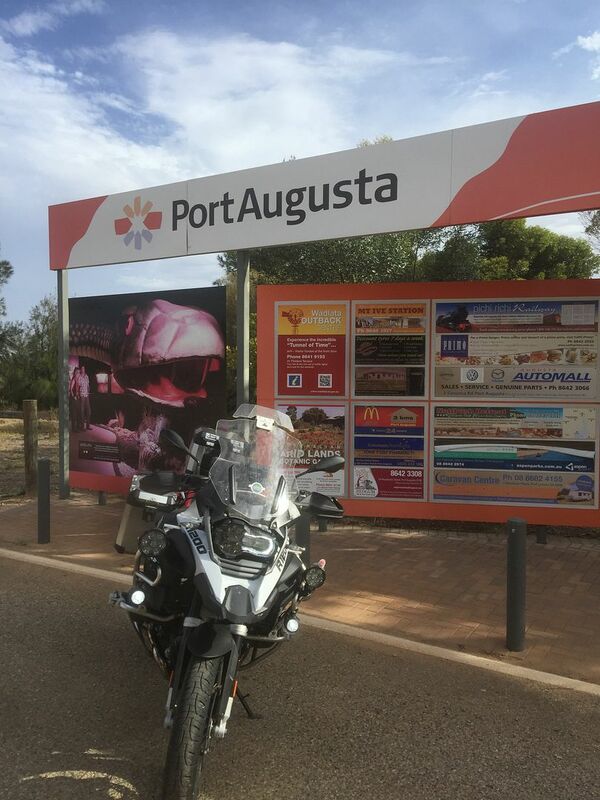 Feeling more alive, it was back on the bike to continue onto to Port Augusta. Day 4 heading eastwards across SA. Before too long Iron Knob came into view, with its impressive mining vista, followed not too much later by the junction with the B100 Highway, where I turned for the final run into Port Augusta. 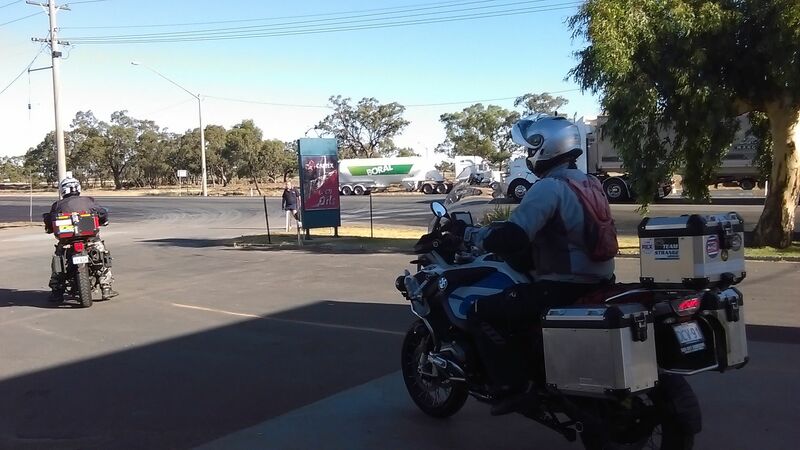 This fuel stop was at the Coles on the western side of the town, I was in and out pretty quickly, followed by a quick double check on the best route to Renmark. Google confirmed the earlier phone call with Bec that south to Crystal Brook was the quickest route, so off I headed on the A1. Feeling dog weary now and contemplating the run across to Renmark, my spirits were lifted when the phone rang with a US number. It was Dan Simmonds calling from Pennsylvania. Dan had been following my Spot and had rung at just the right time. 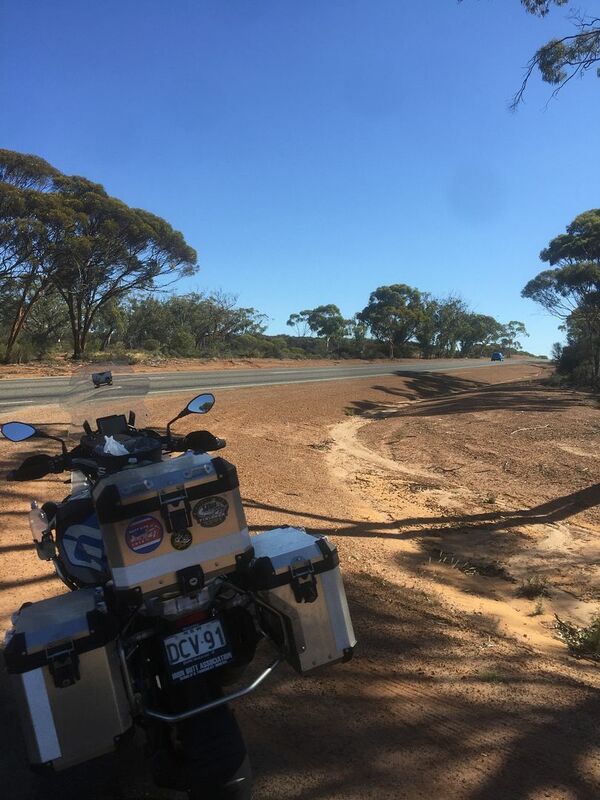 We chatted for a while as the miles rolled until the phone signal became too weak, just before the turn off to head up through the hills towards Burra, Morgan and then Renmark. Feeling buoyed by Dan’s phone call I made good progress through Gulnare towards Spalding. Riding through the main street of Spalding I encountered Reg and Daisy waiting patiently beside the road for me, what troopers! 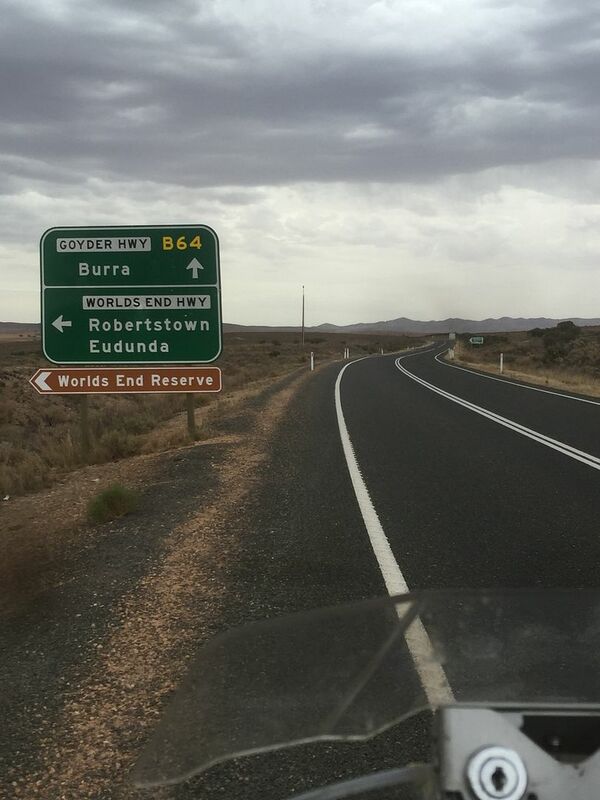 We chatted and then headed off together for the run past Burra and onto Morgan. Out past the World’s End Highway we came across a wombat ambling around on the highway. We all slowed and did our best to encourage the little fellow off the road, and I think Reg managed to shoo him away before any oncoming traffic cleaned him up. 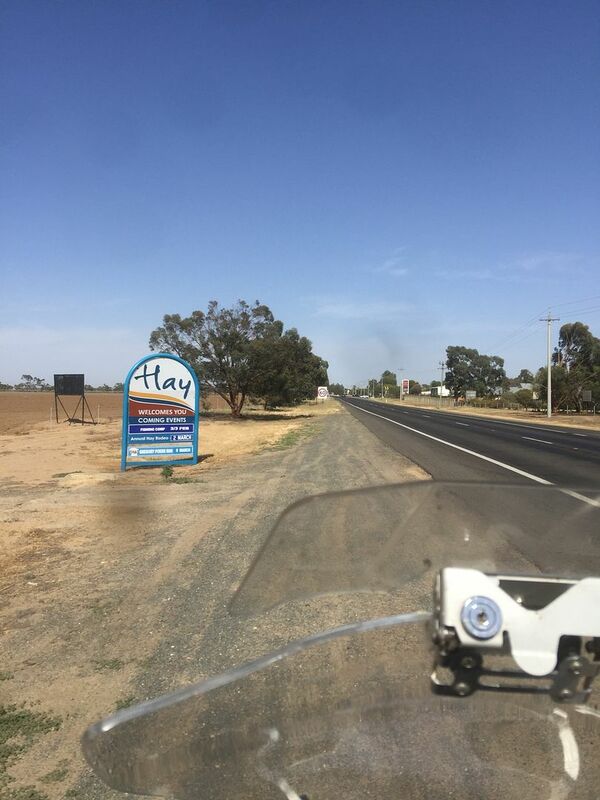 The town of Morgan came and went, and not too long after we came across Ron & Marls who had ridden down from Mildura to join us. Pulling into the BP Renmark to refuel we had a small gathering outside the servo while I cooled down, put on my cooling vest and generally got ready for the next leg to Mildura. Reg and Daisy farewelled us here, thanks guys for coming out to make this section of the ride much more interesting. It was great to come into Spalding and see you both there unexpectedly. Back out on the highway it was very warm, mid 30s as we rode towards Mildura. Not a lot to do other than just watch the miles roll by and enjoy the scenery shimmering away in the heat haze of a summer’s afternoon. Marls did the sensible thing and retired home at Mildura, while Ron led me through the shortcut route in a Sunday afternoon in Mildura. This saved a few minutes off the schedule, which all helps! From there we rode together in the afternoon heat to Euston, where Ron flagged me onwards. Thanks Ron and Marls! 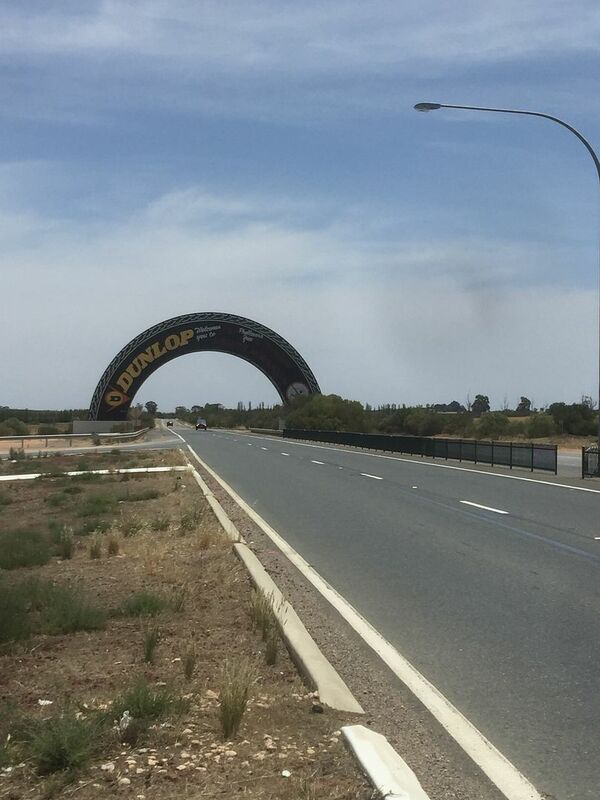 Every bit helps and the guiding through Mildura really helped me keep my ride rhythm going. The heat was now mid to high 30s warm, but not unbearably so. I kept drinking water and electrolytes along with the odd salt tablet. 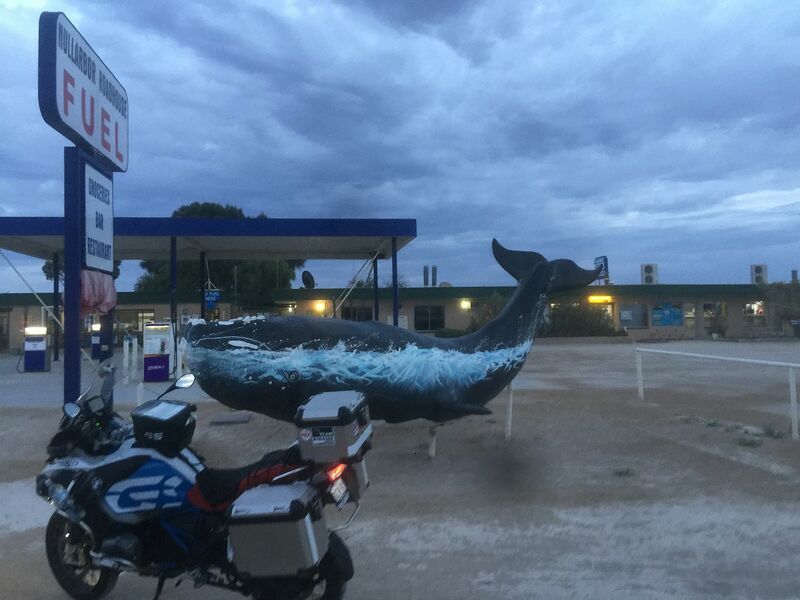 Riding into Balranald I stopped at the Shell servo to soak my cooling vest, when suddenly 3 other bikes materialised out of nowhere! It was Fatman & LTP, along with Derrick and Hackle, who had come out of Victoria to ensure I stayed on the straight and narrow and didn’t deviate back into Victoria. It was great to see everyone, and while I did my thing, the team valeted the bike, AND discovered a whopping large nail in my rear tyre! What to do? After some consultation, and as the tyre was clearly not deflating, it was a case of letting sleeping dogs lie and not removing the offending nail. Better to leave things as they were and monitor the tyre pressure as we crossed the Hay Plain. As a back up I had some extra tyre repair gunk purchased at Balranald just in case. Fatman making sure I got back onto the bike! To say my spirts had sunk when said nail was discovered would be an understatement, but continuing riding and watching the tyre pressure stay constant was reassuring, along with the great company. We leapfrogged our way to Hay, where Derrick continued with me to Narrandera, while the others headed for home in Victoria. Riding into Narrandera I farewelled Derrick. It was a wonderful surprise to have such esteemed company along for the ride, especially given the new-found nail. 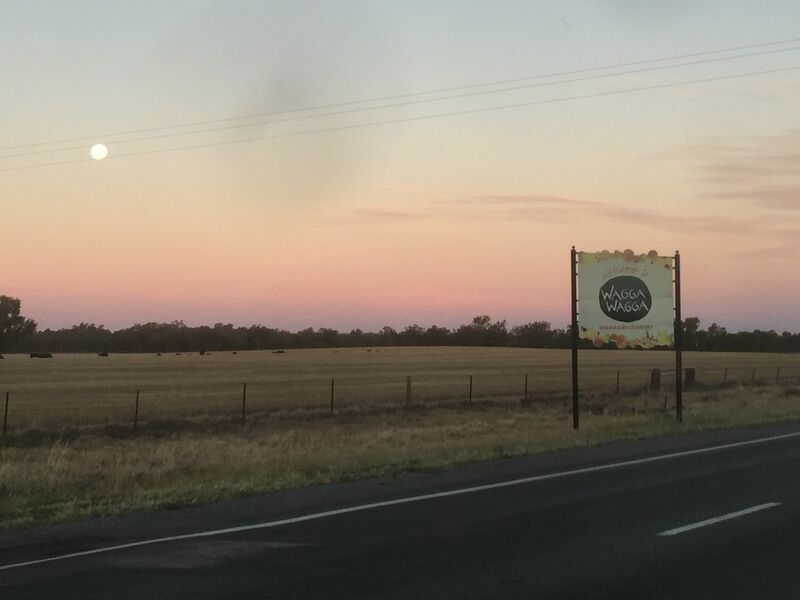 It was still high 30s heading into Wagga but the sunset was spectacular, and the moon was also coming up. What a sight! About 20 minutes out of Wagga my phone rang and it was Vlad, who was out and about in the area. 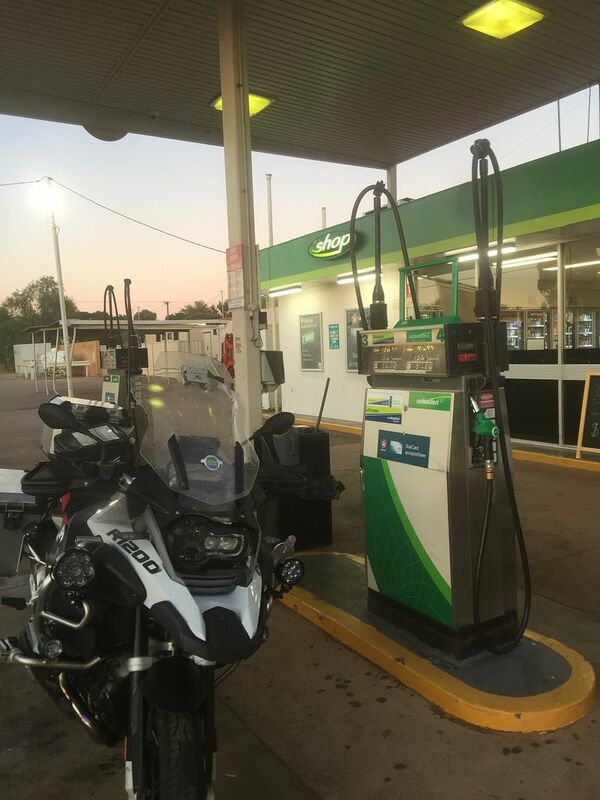 We arranged to meet in Wagga for the last fuel stop of my ride plus time for a quick snack. There was a slight mix up in meeting points, but we managed to coordinate eventually and arrive at the right service station. Refuelling complete, we adjourned for a quick snack at the next-door Macca’s and were soon joined by Philmor! Geez it’s busy out here at this time of the night! And watching the moon rise! I was spoiled to have such great company for the ride from Wagga on wards towards Sydney. Re-joining the Hume Highway we made our way northwards with the semis in the dark. The temperatures were still warm and flickering lightening threatened a storm ahead. About half way between Yass and Goulburn I had to stop and have some time off the bike, I was finding the never-ending line of trucks with their red lights mesmerising, and just needed to reset. 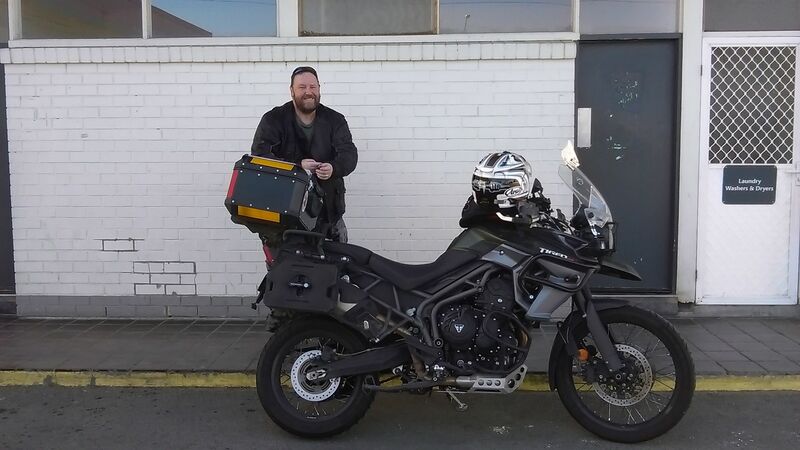 Vlad led from here on, with Frans joining us on his Goldwing at Goulburn! Phil waved goodbye at Marulan. Thanks for coming out Phil, it was great to see you. By now there was a light drizzle, which while the cooler temperature was welcome, the drizzle less so. Still not to worry, and before too long, we passed through the Southern Highlands and the outskirts of Sydney came into view. 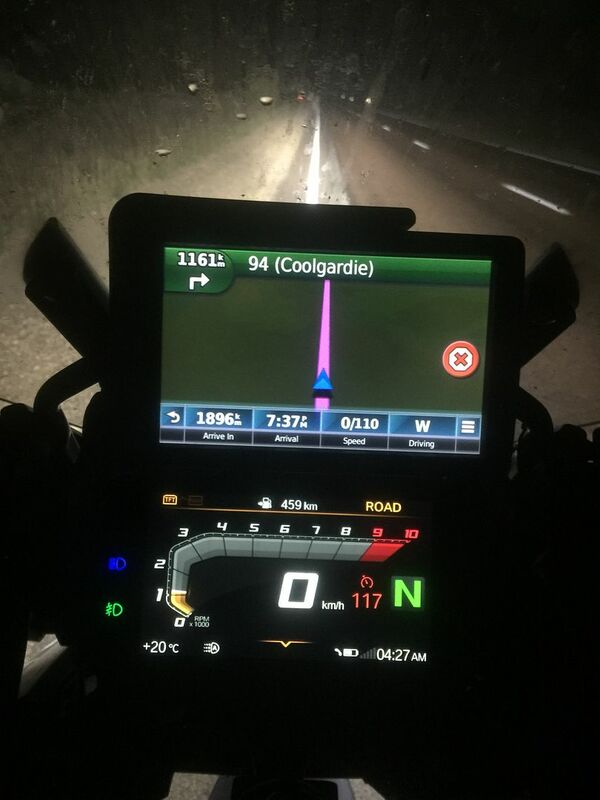 Like a dog scenting home, the riding was easy from here onwards, the M5 tunnel was open and we made good progress through the suburbs into Coogee, finally rolling into the Caltex Servo in Coogee, a little after 2:00am. Job done! 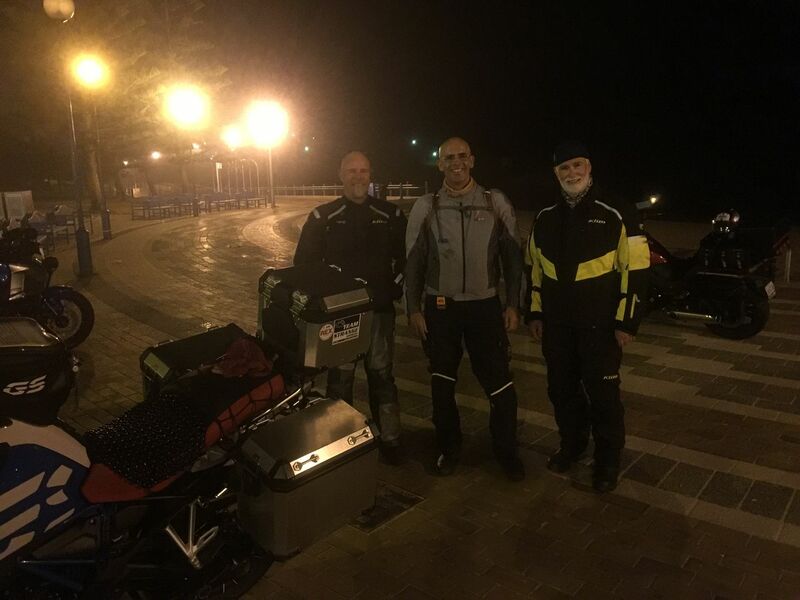 Tele joined us too, he had ridden down from Newcastle on his new R1200GSA, so I had my three witness there on hand to sign me in at the end of this 100CCC. Thanks, guys, for shepherding me through to the finish line. Day 4 was tough, and the support I received along the way really made a difference. This ride was perfect practise for the IBR 19. Midsummer heat plus the extreme heat on Day 1 was a good reminder of what we may face in June in the States. It also allowed me to practise my riding and fuel stop strategies, with a few good reminders along the way. This is my 3rd crossing of the country in search of a 50CC/100CCC, and having done this one in mid-summer I would have to say I prefer doing early mid-summer as opposed to early autumn. Just a thought. Now time to prepare and submit the paperwork! What good prep for the IBR, well done Martin in completing the 100CCC in trying conditions, you nailed it alright! LTP and I enjoyed our brief intercept and the ride with you across the Hay Plains, what a fantastic turn out from the IBA community meeting up with you along the route.. Thanks for sharing your ride. The report and pictures along the way were thoroughly enjoyed. valuable input for me into my strategies for heat management. Really enjoyed reading this Martin. Thank you! The lights of Sydney on day 4 must have been welcome. Shame I couldn’t arrange an intercept, but I couldn’t make it happen. Great support from others though. Dedication and concentration, as well as heeding the early signs of fatigue and taking the necessary steps to keep yourself in the game. Thoroughly enjoyed meeting you and shaking your hand. I'm going to be watching IBR19 with even greater interest now. Certainly a great ride Martin and a big two thumbs up. Tele, it doesn't matter re the time. It was a very testing ride in extremely testing conditions. To be able to share a brief time on the Hay Plains with you Martin was my pleasure. My Sunday timetable was bare and Elwyn wanted the house to herself. Great preparation for the IBA later in the year. Cheers. Congratulations on a great ride! Excellent riding Martin. Your consistency is amazing. Great report and thanks for all the photos. Some iconic ones in there too. Well done to all the supporters too, for getting out in tough conditions to support one of our warriors. You've gotta love the remoteness we are able to travel through! Happy to run lead while in the nanny state. Those on the road didn't blink an eye west of Euston. Well done on achieving the double crossing. Wow , tough ride Martin ! Thanks for sharing it was inspiring. Quite a saga to remember for the report. And well done having the discipline to take all those photos. I'll certainly be trying to suss out your SPOT on the IBR19. Recalling guys being hospitalised with heat stroke in 2017, the strategies you've used here should ensure your beating the USA deserts. Impressive effort Martin! Very consistent progress in trying conditions well told. Thanks mate. Great ride Martin. The IBR will add the challenges of bonus hunting to the mix, but being at one with your bike is key to give you the mental agility for that. This arrived in the mail last week. I feel chuffed. You should feel chuffed! An amazing effort from any perspective.